Universal Studios Japan announced this week that the Harry Potter and the Forbidden Journey attraction at their Wizarding World of Harry Potter's Hogwarts Castle in Osaka will be in 3D. 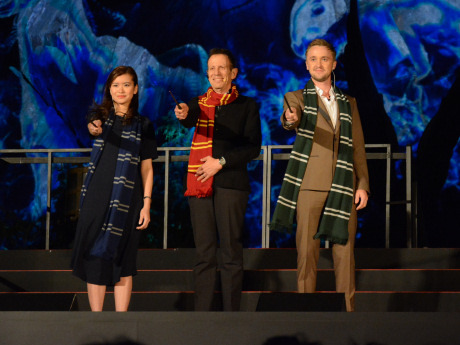 Harry Potter actors Tom Felton and Katie Leung were at the attraction, which opens to all this Thursday, May 21, this week to kick off the opening. To celebrate greater magic in the second year at The Wizarding World of Harry Potter in Universal Studios Japan, a ceremony for the announcement of “New Magical Experience” and its advance premiere was held today, May 20th (Wed). The world’s leading attraction “Harry Potter and the Forbidden Journey” has been evolved into 3D and will open tomorrow on May 21st as the first and only in the world. With Harry Potter film talent Tom Felton and Katie Leung, and Universal Studios Japan’s ambassador SMAP, a spell was cast upon the magnificent Hogwarts castle to celebrate the opening of this new experience. Thunderous cheer was heard from three hundred Harry Potter fans wearing scarves of Hogwarts School of Witchcraft and Wizardry at 19:40, when the ceremony started, the members of SMAP, Universal Studios Japan’s ambassadors, appeared on the stage in front of Hogwarts castle, and introduced Harry Potter film talent Tom Felton, who portrayed Harry Potter’s classmate and nemesis Draco Malfoy, and Katie Leung, who portrayed Cho Chang famous for Harry’s first crush, made an appearance with Glenn Gumpel, Chairman and CEO of USJ, Co., when he announced to open “Harry Potter and the Forbidden Journey” in 4K3D, which has been evolved into 3D for the first time. The fans reacted with cheers and surprises. Along with the fans, they all cast “Expecto Patronum” towards Hogwarts castle. Then the crowd squealed for joy as eagle, rabbit, weasel and stag Patronuses appeared on the walls of Hogwarts, followed by a special display of fireworks. All the celebrities had experienced “Harry Potter and the Forbidden Journey” prior to the ceremony. Tom commented, “It was always a great ride, now it’s even more immersive. I tried to grab the golden snitch several times. Then Katie said that I tried to grab the snitch but it was unsuccessful. Coming face to face with the dragon and Dementor was terrifying. “Greater Magic in the 2nd Year. I was surprised that Universal Studios Japan made the world best which is beyond the own world best”, said Mr. Katori. “This attraction won’t disappoint the people who experience the ride last year and it is too awesome to remember the previous one “ Mr. Nakai commented. Mr. Kimura said that I was proud of having the world best and 1st entertainment in the world in Japan here. CEO of USJ Co., Ltd, operating company of Universal Studios Japan, Glenn Gumpel made the following statement. “In 2014, so many guests visited The Wizarding World of Harry Potter at Universal Studios Japan. I’d like to take this opportunity to sincerely thank all of you. As promised Universal Studios Japan will continue to deliver the “World’s Best” entertainments and will keep taking on new challenges. Katie put up a quick Instagram video of her visiting Honeydukes at Universal Studios Japan, which can be seen here.